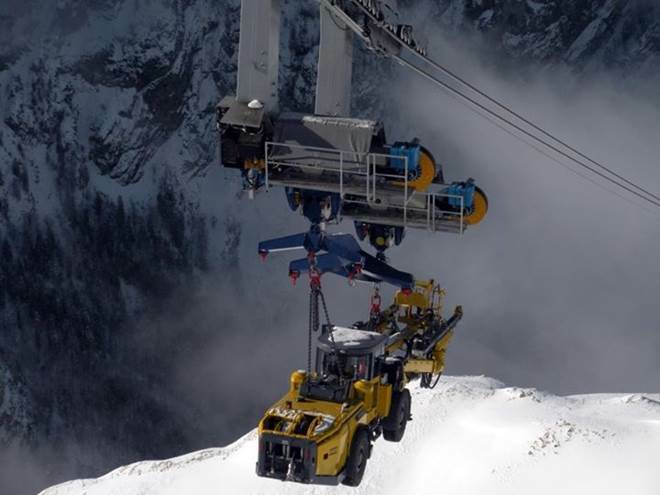 Swiss Trucks Travel Up Mountain On Ropeway! Swiss ingenuity has seen Swiss trucks travel up a mountain on a ropeway in one of the world’s most amazing current power projects. The Linthal 2015 project involves building a 2.35 billion dollar underground pumped water storage power plant. When completed it will be able to produce 1480 MW of power, which is as much as a nuclear power plant. The big difference between this and other large construction projects is that there are no roads linking the construction sites. This has lead to some clever thinking and as a result Swiss trucks travel via ropeway between the sites! Huge Swiss trucks, tunneling machinery and excavators riding up and down the two ropeways have been the cause of some wonderful viewing opportunities for onlookers and delights for photographers. With the construction sites being 811 metres above sea level at the lowest point, to 2,474 metres at the highest, the Linthal 2015 project certainly rates as one of the most interesting ones Swiss trucks have taken part in! We are very happy that Western Australia is generally flat and hot. No ropeways required! Hats off to the Swiss though for their incredible tenacity. For road freight services in WA, please call (08) 9410 1726. Find out more about the Linthal 2015 project. Volvo Testing Electric Roads For Buses 1934 AEC Road Train – Australia’s First Road Train How To Help Australian Farmers In The Drought Are Self-Driving Cars the Future?